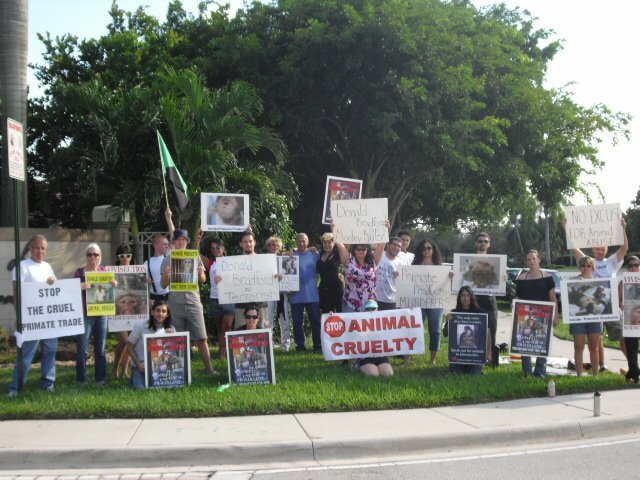 On October 10th, a large group of activists stood outside the gates of the Estates of Pembroke Shores. Inside that gated community lives Donald Bradford, president of Primate Products. Primate Products is a vicious company that both breeds monkeys and imports them from Asia. These innocent animal victims are then sold to be tortured and murdered in unnecessary and sadistic experiments at the hands of cowardly vivisectors. In late August, shocking photographs were leaked from their Miami facility. The graphic images can be seen here. Donald Bradford, that heartless man who oversees this particular link in the primate slave trade, has admitted that these primates do suffer and has told us before that he is against vivisection, but thinks that he must get blood on his hands, lest an even worse monster take his place. With one voice, We charge him with being a greedy hypocrite and a primate murderer! Bradford admits that it is wrong, yet he still does it! He admits they suffer, yet he insists on being the person to profit off of this sick enterprise… Donald Bradford, it’s your fault! We successfully pamphleted cars passing by and spoke to pedestrians, exposing this monster to his neighbors. The heartfelt concern community residents expressed for the primates Donald Bradford viciously exploits was clear. 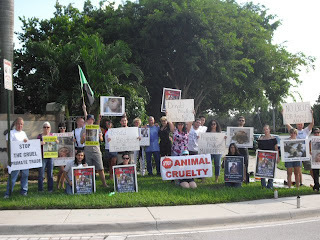 The neighborhood is filled with compassionate animal lovers who were noticeably moved by our message. Their righteous response is an inspiration to us. With loving concern like theirs to motivate our campaign, the imprisoned primates may have a chance to live lives free of the pain and suffering Bradford profits from. 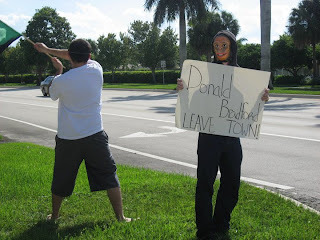 Donald Bradford, we will never back down until you stop the killing! How do the activists know when to gather? I didn't know there was an anti HLS in south florida, great news!